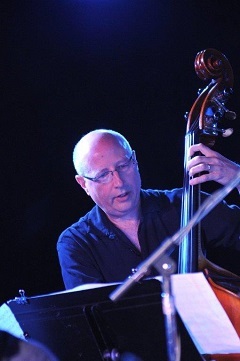 Paul Rostock has served on the faculty of Moravian College since 1991 as an artist/lecturer and instructor of Double Bass and Bass Guitar. He has directed jazz ensembles, taught private jazz history and improvisation practicums and directs the Moravian Bass Ensemble. Paul also serves as a director for the annual Summer Youth Jazz Camp. A versatile and sought after freelance musician, Paul has appeared with many popular artists including Frank Sinatra, Michael Feinstein, Steve Tyrell, Monica Mancini, Maureen McGovern, Toni Tennille and Bobby Rydell. Jazz artists Paul has performed with include Maynard Ferguson, Phil Woods, Clark Terry, Urbie Green, Randy Brecker, Stanley Turrentine, Bob Dorough, Carl Fontana, Jon Faddis and David “Fathead” Newman. Regional jazz groups Paul is associated with include Dave Roper Trio, Rob Stoneback Big Band, David Leonhardt, Marko Marcinko and La Cuchina. He has appeared at the COTA festival since its inception and often performs at the Deer Head Inn. Paul also toured and recorded with the late vocalist Frank Sinatra Jr for more than three decades.